2012 Alphonse Mellot, Sancerre Rouge, Les Herses, Loire Valley, France. A “cult” Pinot Noir from the Loire the Alphone Mellot Sancerre Rouge is living up to the hype, this deep and Sonoma Coast dark red is jaw-dropping, it takes some decanting and time, this 2012, but wow, when it opens it is stunning. A recent Loire tasting as all it took to make me a believer in Alphonse Mellot’s Pinot, but like Burgundy these wines need some age on them, the 2012 when I first tasted it about 7 months ago was massive and so tight it was too hard to judge, but now it is really starting to reveal gorgeous detail and is opening up wonderfully, while remaining vigorous and intense, this is wildly impressive and exciting stuff with a gloriously long finish. Grown on Silex soils and small yields help bring out concentration and the cone is particularly rich in color, making Mellot’s Sancerre Rouge unique and powerful in the glass, especially the Les Herses which has a garnet and ruby hue. While pouring into a decanter waves of floral perfume, earth, flint/stones and spices came rushing out with dried violets, leather, red rose petal, a hint of graphite and kirsch coming into focus along with touch of mint, clay and forest berries. The palate is firm and well structured with black raspberry, plum, currant and sweet red cherry fruit as well as anise, cinnamon stick, sticky lavender, cedar and smoky mineral. This young Pinot feels more Nuits-St.-Georges than Loire with briar, bramble and grippy tannins, the pretty elements take the center stage when allowed the grace period to awaken, be patient and reap the rewards, I’d give it another 3 to 5 years to really become a superstar, it certainly shows the core of a great wine, best from 2018 to 2029. If you can’t wait, then be sure to make an evening of this Sancerre Rouge and may I suggest duck breast or wild mushroom dishes, this is serious juice to be celebrated and it needs food to shine. 2014 Weinget Leitz, Dragonstone Riesling Sekt, Sparkling Wine, Rheingau Germany. The beautiful and thrilling Dragonstone Riesling Sekt is another brilliant creation from Johannes Leitz, it is a slightly drier, leesy and bubbly version of his famed Dragonstone Riesling from Rudesheim on the Rhein. The Drachenstein sparkler is a wonderful addition to the Leitz family of wines and is not just a celebration once in a while offering, this is a serious food wine and drink often Riesling that goes with a wide range of cuisine, it has enough complexity and vitality to please in almost any setting. In other words this is not a novelty item, but a wine you’ll want around in numbers! 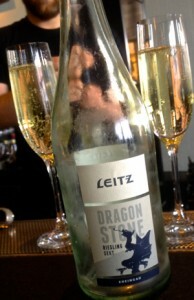 The Leitz Dragonstone Sekt bubbles turns on the charm the second it hits the glass, in fact even before you taste it you’ll be licking your lips as the packaging is superb, it beads gracefully with fine small bubbles and the mousse is luxurious this is really fun stuff with a Riesling mineral driven character. The nose has golden fig, chalk dust, rosewater, hazelnut and apple start before a steely palate of lime, peach, yeasty notes and a touch of honey balanced with salty wet stones, dried pineapple and lemon oil tanginess in this slightly sweet, but focused sparkling wine. There is good extract and density here, same as the still wine version, though it feels delicate and the sugar level adds a welcoming caress of grace, texture and pleasure, it is the perfect foil to the natural acidity and overall the impression is about extra dry, making for a less severe style, but still very controlled, flexible and refreshing. I can see a lot of this in my future, and I highly recommend you chase this beauty down, last year’s Pinot Noir Sekt sold out fast, so don’t wait to long to get your hands on Leitz’s Dragonstone Bubbly! 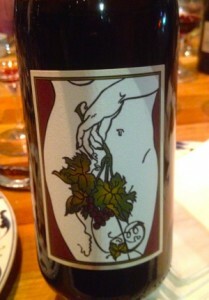 I sampled it at the famed Slanted Door, where it is BTG (by the glass) a perfect place to give it a test drive! 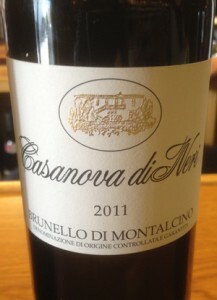 2011 Casanova di Neri, White Label, Brunello di Montalcino DOCG, Tuscan Red, Italy. It was a pleasure to meet Giavanni Neri and taste through the latest Casanova di Neri wines, Casanova di Neri is one of Italy’s great wineries and a blue chip standard Brunello year after year. The new set of Casanova di Neri is an amazing lineup from the humble Rosso di Neri to the mind-blowing perfection of the 2010 Cerretalto Brunello! Of course, I was most interested in the soon to be released 2011 Brunello offerings, and how they’d compare to the 2010’s, so I picked the classic White Label to focus on, though I did try the 2011 Tenuta Nuova with Giavanni as well and while not as firm or as focused as the 2010’s these 2011 wines are highly enjoyable and wonderfully expressive and impressive. Similar to 2011 Barolo, these wines gained from the warmer summer heat, these are more generous wines with sweeter tannins and will be easy to please in their youth, but Casanova di Neri really did a great job here, as these Sangiovese Grosso Brunello di Montalcino 2011’s both have balance, depth and vitality. The 2011 Casanova di Neri White Label, the Brunello Normale, is full of flavor, extract and energy with ripe fruit, structure to match and pleasing mouth feel. The 2010 Cerretalto Brunello by di Neri and the 2011 Tenuta Nuova are absolutely stunning wines, but both learn towards Bordeaux in style, and in price, especially the Cerretalto at $375/bt is in league with the great Paulliacs, with the Tenuta Nuova being more Right Bank in style, while the 2011 Casanova di Neri White Label shows more it’s Tuscan soul. The 2011 White Label Brunello di Montalcino starts with a touch of graphite/flint, red raspberry, sweet minty herbs, light floral tones and cigar wrapper leading to a full and round palate of blackberry, cherry, spiced plum and wild strawberry fruits along with cedar, black fig, anise and warm stones. The body is lavishly textured, but there is lift and vigor with just enough acidity and fine tannin to framed this spot on Brunello. This will be a sleeper, while most people will chase the top end wines and or keep tracking down 2010’s, this looks set to be a great wine that might get overlooked, that will be a mistake, this is one to have and drink over the next decade, it’s very nice stuff. The 2011’s should be widely available in March, be sure to keep an eye out for these Casanova di Neri’s, and if you like Tuscan reds, then you’ll love the stylish flare of di Neri! 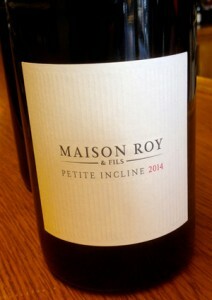 2014 Maison Roy & Fils, Pinot Noir, Petite Incline, Willamette Valley, Oregon. Even better and more dense than the glorious premier release 2013, the new 2014 Petite Incline from Marc-Andre Roy and Jared Etzel is the real deal with expressive fruit, depth and multi layered texture. The deep color and almost blackberry first impression lead into a rich and decedent Pinot Noir with violets, rose oil, smoky/toasty wood, framboise and mixed spices, briar notes and sweet herbs highlighting a core of cherry and plum fruit. Hints of earth and mineral float well in to background in this well crafted wine, both Marc-Andre and Jared are sons of the founders of Beaux Freres, and yes there are similarities and a pedigree of style that flows in this next generation project. This wine has balance, length, vitality and gorgeous detail and should develop nicely in bottle with smooth ripe tannins, perfectly judged acidity and energy even hard-core Burgundy lovers will be smitten with this new Maison Roy Pinot. The Petite Incline is made from grapes from well established vineyards in the Willamette Valley and oh my is is a great value for the quality, it is much the same in terms of quality and price to St. Innocent and certainly is a wine to hunt for if you like Oregon Pinot. The 2014 vintage in Oregon, like 2008 in style, will be one you want to owe, check the new Ken Wright’s, Johan as well as this one, they are all available now and will go fast. Drink the stunning 2014 Petite Incline from Maison Roy from 2017 to 2027, don’t miss out on this rising star. 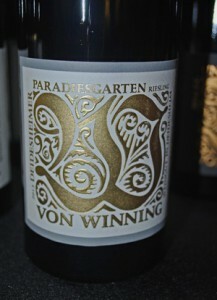 2014 Weingut von Winning, Riesling Trocken, Deidesheimer Paradiesgarten Erste Lage, Pfalz Germany. The bright and clear pale gold Paradiesgarten 1er Lage Trocken, one of von Winning’s Premier Cru dry Rieslings, is like a swan, is is beautiful and graceful, though while young is a bit awkward and even a touch ugly, but wow it is really starting to blossom now and is a glorious and dynamic wine. The 2014 Deidesheimer Paradiesgarten Cru leads with white flowers, rosewater, salty herbs with lemongrass and intense mineral notes leading to vibrant lime, tangy green apple, hints of white peach, mango skin, nectarine and wet stones. The extract is chalky and there is a touch of earthy complexity starting to emerge which adds character, this wine certainly looks to be a classic, it just needs a bit more time to unwind completely, it is von Winning’s best deal in dry Cru Rieslings and it as it opens in the glass gets very Chablis steely and reveals more textural pleasure and charm. I might call it nervy at first sip, but by the third sip you are beginning to rock and roll, I love it personally and can’t wait for Spring and Summer evenings to enjoy this racy white with it’s crisp and cool vigorous acidity and tightly wound focus. While not as generous and flamboyant as the Grosses Gewachs, this is a super wine with great mid term potential and rewards, drink over the next decade. For the best value from von Winning be sure to look for this and the new 2015 Riesling “Winnings” that has just a bit of sweetness, they are both steals! 2014 Domaine Jerome Gradassi, Chateauneuf-du-Pape, Rhone Red, France. 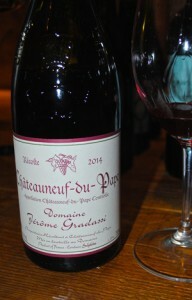 The 2014 Jerome Gradassi Chateauneuf is one of the most exciting examples of this historic region I’ve tried in years, and is an amazing value in tiny production handcrafted old vine Chateauneuf-du-Pape. Gradassi is much more famous for his Michelin-starred L’Isle Sonnante restaurant located in Avignon, but after taking over a parcel of ancient Grenache that was once his grandfathers he taught himself how to make wine, very much influenced by hard work and tradition, and through trial an error, Jerome has led himself down the natural winemaking path in his very rustic cellar. The 2014 Domaine Jerome Gradassi Chateauneuf-du-Pape Rouge was fermented 100% whole-cluster, in underground cement vats with native yeasts and almost no sulfur, everything is done by hand, in fact it is rumored he uses a bucket and rope to move the fermented juice to cask! The Chateauneuf is a cuvee of 75% Grenache and 25% Mourvedre, with the stems, as well as 4 week maceration and hand punch downs makes for a rustic and spicy wine, but good ripe berries and 10 months in very old barrel/cask help smooth the tannins and it is remarkably fresh and vibrant. The nose is all earth, cracked pepper and wild lavender with hints of kirsch, raspberry and anise leading to a medium full bodied palate of much the same along with boysenberry, plum and pomegranate fruits, sweet tobacco leaf, a hint of black olive, game, grilled herbs and a lingering note of framboise. This wine has a real thrill about it and I love it’s intensity, spice and rawness, it can be approached now, especially with robust cuisine and or cheeses, but should really age well offering intriguing rewards for those with patience, drink from 2018 to 2026, this is impressive and a very dry Chateauneuf expression, imported by Martine’s Wines. 2015 Bedrock, Nouveau Zinfandel, California. It took me way too long to get my hands on this wine, I should have tried it back in November, but it was almost impossible to find, this is Bedrock’s Zin tribute to Beaujolais Nouveau and it is really fun and tasty! Great China in Berkeley is still pouring it by the glass and that is were I got my first taste of this carbonic Nouveau Zinfandel made by Morgan Twain-Peterson. It smells a bit like bubble gum and has classic fruity character, but I enjoyed it and it was surprising good with food, with ripe plum, sweet strawberry, a bit of raspberry jello, cranberry and cherry fruits on the palate. This light/medium bodied Zinfandel plays the part of Gamay very well, it is bright and vibrant with nice dark flavors and even though it is quite simple it pleases the senses. This is fun stuff and I hope Bedrock keeps making it, I will be much quicker in getting it next time if they do, to celebrate the vintage. Of course this won’t blow your mind with depth or complexity, but it does give you a hint that 2015 should be a pretty darn good year and you must admire the serious time and effort to make it, just so we can have some fun, hats off to Bedrock, it was worth the wait and fingers crossed for this year! 2013 COS, Pithos Rosso, Vittoria, Sicily, Italy. 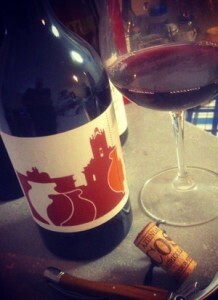 Pithos is Giuisto Occhipinti’s amphora raised organic Nero d’Avola and Frappato red blend from Vittoria Sicily, think Cerasuolo di Vittoria meets orange wine, and it is one of the best wines to come out of terra-cotta I’ve ever had. COS has changed to a no wood policy in the cellar with dramatic effects, especially in the Pithos lineup of white and red, so now Occhipinti uses tank, cement and Spanish terra-cotta “Kvervi” egg shaped clay vessel to age his wines. The Pithos Rosso, 60% Nero d’Avola and 40% Frappato, is from de-stemmed grapes aged on the skins in amphora set into the earth for up to a year, and this vibrant and tangy 2013 vintage is a stunner with it’s Georgian influence showing with loads of complex skin tannins and antioxidant accents giving substance and framework to this impressive red. The nose has dried flowers, red currants, Spicy cinnamon stick, chalky earthiness and savory tones that lead to a fine grained palate of spiced plum, black cherry, strawberry and briar laced vine picked berries along with wild herbs, dusty tannins, backed earth/stones, grilled fennel, lavender as well as light red peach and orange marmalade notes. There is about 12% alcohol and a remarkably vibrant and fresh nature to this wine, it is both pleasing and thought provoking, it is a lovely and exotic Sicilian beauty, both this and the white versions are intriguing efforts, I’ve tasted this Pithos red twice, once prior to release with Giusto at a COS seminar in SF with his importer Domaine Select and just last night at home, it has really filled out in the last six months, it has gained detail, depth and is a wonderfully textured wine at this point, drink from 2016 to 2026. 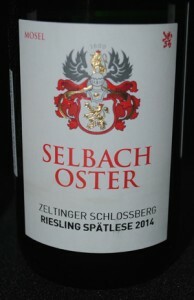 2014 Weingut Selbach-Oster, Riesling Spatlese, Zeltinger Schlossberg, Mosel Germany. One of my all time favorite vineyard sites and maybe the best 2014 Mosel for the money the classic Spatlese Zeltinger Schlossberg from Johannes Selbach is really moving in the right direction and will offer great rewards for the cellar in the decades to come! The rich and layered Riesling has plenty of extract and depth to age and still thrill with youthful energy, this is highly impressive stuff in a very difficult year for growers in the region, tiny crops, humid and muggy weather and Asian fruit flies played havoc with the grapes, but in the end there are some wines that are spectacular, this is one of them. Of course in recent years the talk has been mostly about Grosses Gewachs and dry style wines in Germany, with good reason as they are some of the best white wines in the world, but overlooking these slightly sweeter wines is a serious mistake, with the mineral driven character and beautiful acidity they are gorgeous to drink and have sublime balance, especially the ones from Selbach-Oster. The 2014 Zeltinger Schlossberg bursts from the glass with white flowers, saline, stones and a hint of honey leading to a gloriously decedent palate that shows a trace of botrytis with lush layers of apricot, dried pineapple, minty herbs, flinty/steely mineral and sweet yellow peaches. This wine is developing a wonderful mouth feel and texture, but a underpinning of bright and tangy acid keeps these in control and there is a nice play of savory and briny elements to keep your interest. Finishes with nice energy, lime blossoms, kiwi, mango and tree picked apple haunt in the background. You can easily enjoy this Riesling now with many foods, but 10 years in the cellar would really be the best option, a treasure for those with patience. 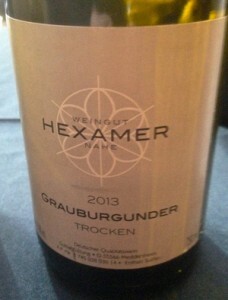 2013 Weingut Hexamer, Grauburgunder Trocken, Nahe Germany. The Hexamer Pinot Gris is a pretty and complex mineral driven white that is both serious and fun with an open leesy charm plus vibrant acidity and smoky spices. The mixed soils of Hexamer’s vines give interesting layers of flavor and vitality to this grape, this is one of the best examples of this varietal in Germany I’ve tasted, the Nahe is one of the great terroirs in the world and this 2013 Hexamer Grauburgunder is a stunner, easily on par with anything coming from Alsace or Alto Adige. Hexameter’s wines always seem to enjoy extra time to unfold, and he let this one spend a bit more time in tank on the lees before bottling, it worked out perfectly allowing an added richness of character to come through, but still being energy filled and cooly crisp, it is very lovely and sharply focused. The 2013 Grauburgunder starts with a hint of smoky/leesy brioche and citrus blossoms leading to a round palate of apple, lemon/lime and melon fruit with fine crushed stones and light mineral notes plus a fresh/dry saline element along with a mix of white tea, ginger and unsweetened honey. This is impressive stuff from Hexamer and it should get even better in bottle over the next 3 to 5 years, though there is no need to wait on this one, unlike his Rieslings that need 5 to 10 years to really show their potential, these latest set of offerings are sleepers and amazing values, especially this Pinot Gris, but be sure to score Hexamer’s 2014 and 2015 Rieslings and in particular the 2014 Feinherb Porphyr and 2014 Quarzit Meddersheimer-Rheingrafenberg, at about $20 per bottle they are excellent bargains to put into your cellar!